News in from Laura Hodd at Oceanstyle that they'll be displaying two motor yachts at the Monaco Yacht Show, the 38.12m Dream On and 42.09m E&E. Built by Ursa Tersanesi in Turkey in 2008, Dream On's steel hull and superstructure are extremely strong, having been designed for trans-oceanic cruising. Astonishing levels of deck and interior space create the volume of a 45 meter yacht in a hull of 38 meters. With accommodation for eight guests in four staterooms, her classic contemporary interior by Bannenberg and Rowell includes everything necessary to sail away immediately: linen, china, cutlery, entertainment systems with a film and CD library. Dream On is asking €9,500,000. E&E was launched as recently as August 2011 by Cizgi Yacht and this voluminous yacht has naval architecture by Vripack and interior design by Art-Line. E&E accommodates 10 guests in a master cabin, two doubles and two twins. She’s powered by twin 750hp Caterpillar engines and has a cruising speed of 11 knots and a maximum speed of 14 knots. Her asking price is €18,495,000. 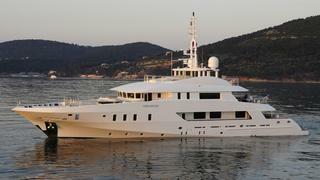 Both superyachts are joint listings with Burgess.